Tick-borne illnesses are on the rise, or at least better reported to the U.S. Centers for Disease Control and Prevention. Lyme disease leads the pack, with some 35,000 cases reported annually but in the Northeast, the black-legged ticks (Ixodes scapularis) also infect people with other maladies, among them anaplasmosis, babesiosis, and now Powassan encephalitis, according to a new paper in Parasites and Vectors. Powassan encephalitis is caused by Powassan virus and its variant, deer tick virus. The virus is spread to people by infected ticks, and can cause central nervous system disruption, encephalitis, and meningitis. There is a 10-15% fatality rate in reported cases, with many survivors suffering long-term neurological damage. Rick Ostfeld, a disease ecologist at the Cary Institute of Ecosystem Studies and one of the paper's authors, comments, "We've seen a rise in this rare but serious illness in parts of New York State that are hotspots for Lyme disease. And we suspected it was tied to an increase in black-legged ticks carrying deer tick virus, particularly on the east side of the Hudson River." This is precisely what a 5-year assessment bore out. 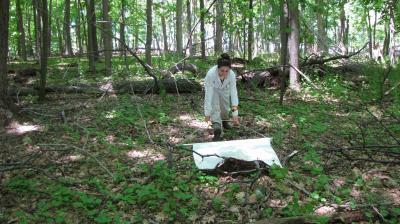 Researchers surveyed ticks at sites east and west of the river. Fieldwork involved collecting ticks off of small mammals and birds, as well as dragging tick cloths near animal burrows and known tick habitats. Routine surveys performed by the New York State Department of Health were also incorporated in the study. More than 13,500 ticks of seven species were assessed. Black-legged ticks made up almost all of the collection. Nymphs and adults were sampled, as these life stages are most likely to infect people. Counties surveyed included Dutchess, Putnam, Westchester, Sullivan, Ulster, Orange, and Rockland. In addition, blood samples were taken from a variety of birds and mammals, to identify deer tick virus hosts. Throughout the study, lab analyses performed at Wadsworth Center's Arbovirus Laboratories found deer tick virus in black-legged ticks. Areas east of the Hudson River had the highest concentration of infected adult ticks – on the order of 4-5% in Westchester, Putnam, and Dutchess counties. Virginia opossums, striped skunks, and raccoons were among the animals found to transmit deer tick virus to feeding ticks. Laura Kramer, one of the paper's authors and a research scientist at the Wadsworth Center, notes: "Our findings are consistent with deer tick virus infection rates in people revealed in clinical tests by the New York State Department of Health. Of fourteen individuals testing seropositive for deer tick virus, ten were residents of Westchester, Putnam, or Dutchess counties. Another two were from Albany and Suffolk counties, areas with burgeoning black-legged tick populations." Adding to the problem: unlike Lyme disease, anaplasmosis, and babesiosis – which take feeding black-legged ticks hours to transmit – deer tick virus transmission can occur in just 15 minutes. This leaves very little 'grace period' for removing ticks, and underscores the importance of vigilance in tick habitat. Ostfeld concludes: "When patients present with encephalitis symptoms in areas with high levels of Lyme disease, especially during the summer, physicians need to consider Powassan encephalitis. While rare, it's associated with significant complications. There is no vaccine or specific antiviral therapy, the best strategy remains prevention." Our knowledge of Powassan encephalitis has grown largely as a result of West Nile virus surveillance. Both are part of the flavivirus group of arboviruses. More extensive arbovirus testing may reveal that deer tick virus is more widespread than previously thought.